Gazing intently at the portrait before him, the elderly Leonardo works on Mona Lisa's elusive smile. His sketches and paint experiments litter his messy studio. Media: Head, hands and feet of Super Sculpey, on a wire armature, and a cloth body. White mohair beard and hair. He wears an olive green tunic under a darker robe. Both are dirty and splashed with paint. He has dirty old brocade slippers on his bare feet. Props: Marianne painted the portrait of Mona Lisa on a tiny handmade canvas, using a tiny brush, actually working off the small palette resting on the wooden crate. Leonardo's sketches were scanned and printed by Marianne. 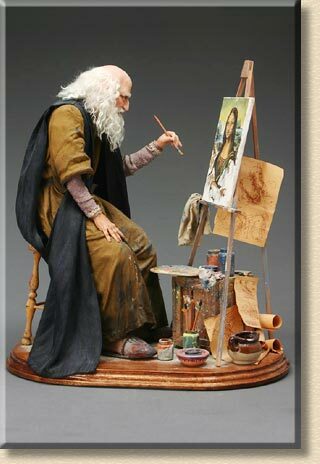 Easel, palette, crate, and stool he's sitting on, were made by Jan Boers.